Speichern Sie den Artikel devolo Home Control Motion Sensor in einen vorhandenen Merkzettel oder erstellen Sie einen Neuen. 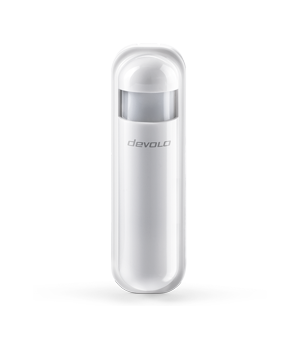 The devolo Home Control Motion Sensor gives you optimal protection in your own home. The wireless PIR Motion Sensor can be positioned discreetly at any desired location of your home and keeps a watchful eye on the surroundings at angles up to 90 degrees. The PIR motion sensor records any movement in all interior areas and wirelessly reports it. As a part of your intelligent smart home system, you are reliably provided information about anything that happens in your home. You can also use the wireless Motion Sensor in a versatile way as an automatic light switch system so that the desired lighting is always there for you when you enter the home. Note: You always need a Z-Wave control unit for control, such as the devolo Home Control Central Unit. Quick and versatile installation via adhesive film or screws (both in the scope of delivery). Individually configurable light sensor for activating additional Home Control components or scenarios. Temperature sensor (FIR) intelligently distinguishes between people, animals and objects. The devolo Home Control Motion Sensor is equipped with an PIR infra-red sensor which monitors your home at night just as accurately as it does during the day. A brightness measurement is used, as necessary, for your light controls. This way you have the ability to automatically switch on selected light fixtures when entering a dark room of the home. As is the case with all devolo Home Control products, the Motion Sensor is also future-proof due to the standardised Z-Wave® wireless technology. Additional components can be integrated into the existing system at any time and combined in a versatile way with the existing components. Place your trust in devolo's many years of experience and in innovations made in Germany. More than 300 awards and numerous quality seals speak for themselves. The simplest smart home solution from the global powerline market leader. More comfort, more safety, lower energy consumption. Discover the intelligent house for yourself. Network everything in your home and control it with the devolo App. The path to voice control is simple: devolo home control owners only need a Google Home or Google Home Mini Smart Speaker. It's easy to link to Google Home, so you can control your home control. Make your devices even smarter! Enjoy sustainability and save money.